INTRODUCTION: Laparoscopic cholecystectomy (LC) has largely replaced open cholecystectomy for the treatment of gallstone disease. However, conversion to open surgery is still relatively common in patients with acute cholecystitis (3.6%~32%) and it has been reported that the complication rate is high in these patients. 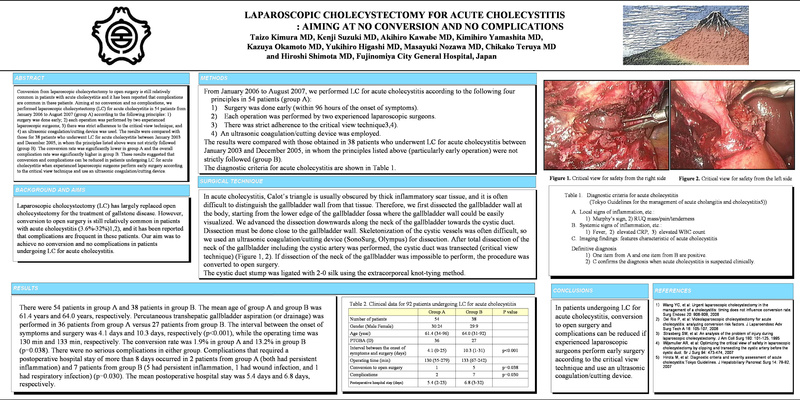 Our aim was no conversion and no complications in patients undergoing LC for acute cholecystitis. METHODS: Since January 2006, we have performed LC for acute cholecystitis, according to the following four principles (group A): 1) early operation (within 96 hours of the onset of symptoms) except in patients with organ dysfunction; 2) each operation performed by two experienced laparoscopic surgeons; 3) strict adherence to the critical view technique; and 4) use of an ultrasonic device for coagulation and cutting. The results were compared with those obtained in patients undergoing LC for acute cholecystitis between January 2003 and December 2005, when the principles listed above (particularly early operation) were not strictly followed (group B).